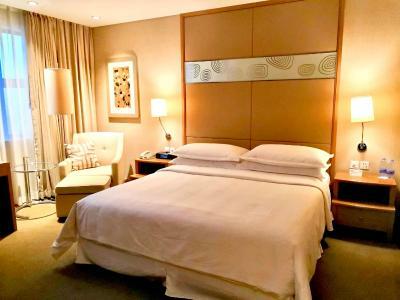 Great access to futian border checkpoint and near Cocopark and a short card ride to huaqiangbeilu - never had an issue getting a taxi and the staff tried their best to accommodate requests - room service was excellent and. 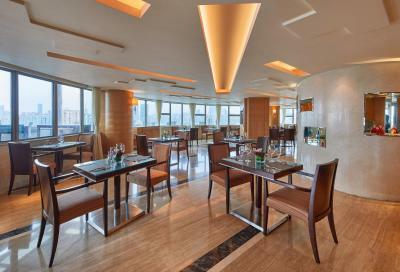 Great selection of dishes - fitness center was also very spacious and well equipped. 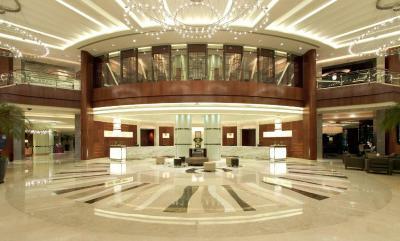 The hotel is as always very nice and clean, facilities are beautiful and very well maintaned. 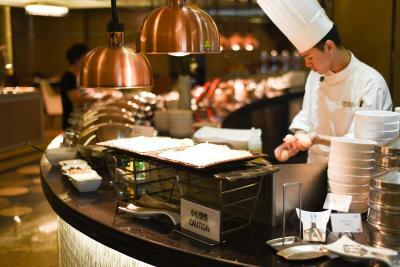 You can order the excellent buffet breakfast (my stay was in October 2018) at the front desk one day in advance in order to get a discounted rate of 103 RMB or approx. USD 7 The gym and pool are top notch. The shower has an overhead rain forest plus a nozzle hose that can be handheld. The staff went above and beyond to accommodate to our needs. They even paid for taxi fare when shuttle bus was full. Jian from customer service is especially good. Very comfortable beds! Excellent breakfast! Nice room! 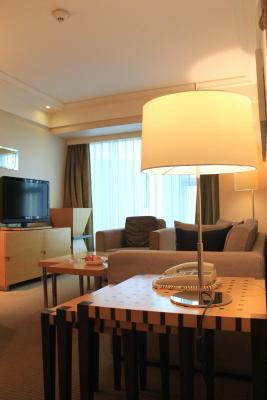 Beautiful and very confortable room, cleaning was perfect also. It is so well located! The breakfast was phenomenal, excellent selection. 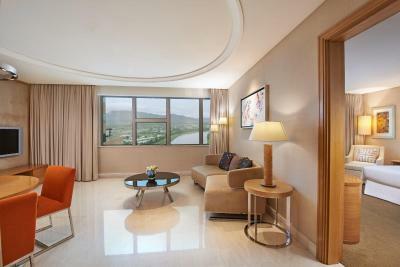 The rooms were well maintained and spacious. The gym and rooftop pool were outstanding. 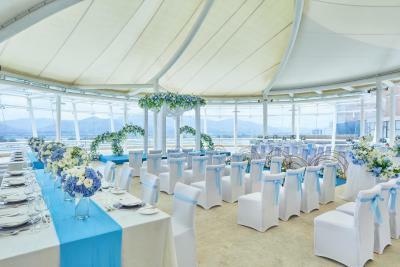 One of our top picks in Shenzhen.Four Points by Sheraton Shenzhen is a 10-minute walk from Lok Ma Chau Port, Huanggang and Futian Border Crossing, and a 10-minute drive from Shenzhen Exhibition Center. The stylish property offers an outdoor pool, a spa and a fitness center along with 4 dining options and a lobby bar. Parking is possible on site. 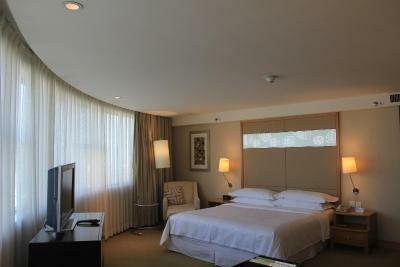 Modern guest rooms and suites are fully air-conditioned and come with a private bathroom. Amenities include a working desk, electric kettle and a flat-screen TV with cable channels. The private bathroom has shower facilities, free toiletries and a hairdryer. Guests can enjoy a variety of massage and beauty treatment at the on-site spa. Laundry and dry cleaning services are also available on request. 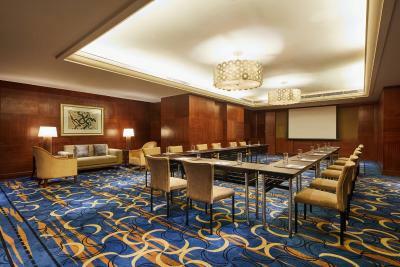 Meeting facilities and fax/photocopying service can be found at the business center. 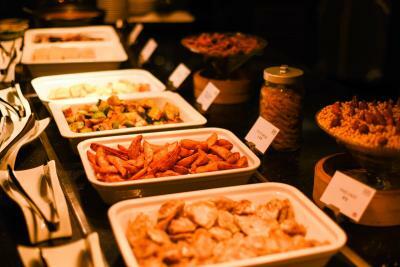 International dishes can be enjoyed in Taste Signature Restaurant, while casual dining and quick bites can be found in Taste Deli. 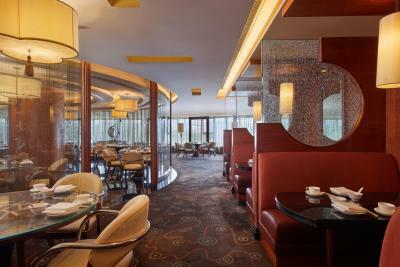 China Spice offers exquisite Cantonese cuisine and flavors from all across the provinces. 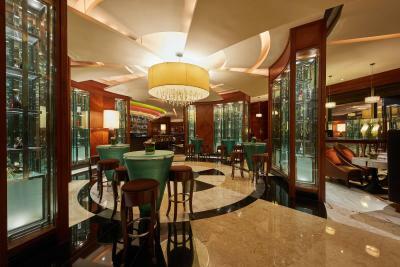 The Grill & Bar provides guests with a wide collection of steaks, wines and signature cocktails. 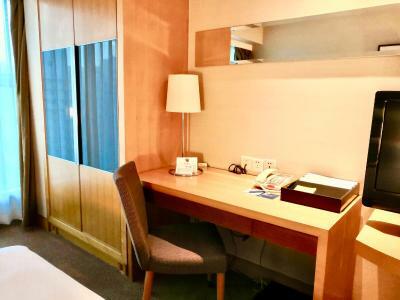 Four Points by Sheraton Shenzhen is a 10-minute drive from the central business district and a 20-minute drive from Window of the World. 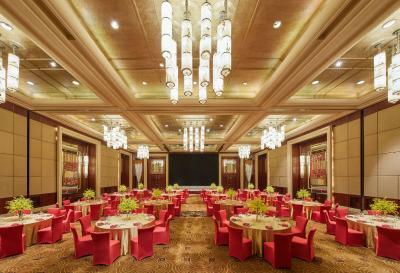 The nearest airport is Shenzhen Bao'an International Airport, 30 minutes' car journey from the property. 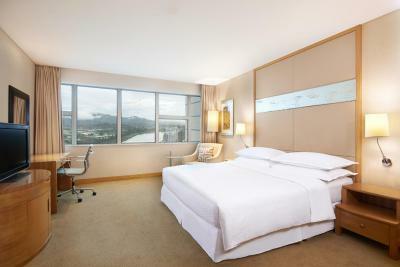 When would you like to stay at Four Points by Sheraton Shenzhen? Location is Everything. 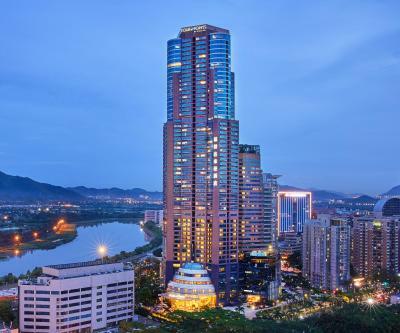 Situated in the Futian Free Trade Zone, Four Points by Sheraton Shenzhen is just minutes away from the Huanggang and Futian border crossings with Hong Kong. 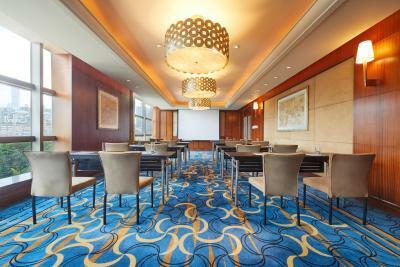 In only 10 minutes you’re in the city center, central business district, and the Shenzhen Convention & Exhibition Center. 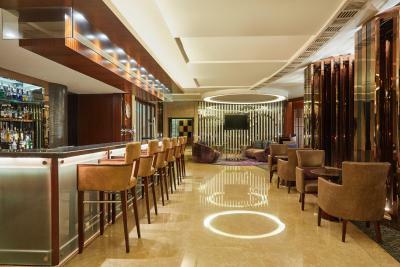 House Rules Four Points by Sheraton Shenzhen takes special requests – add in the next step! 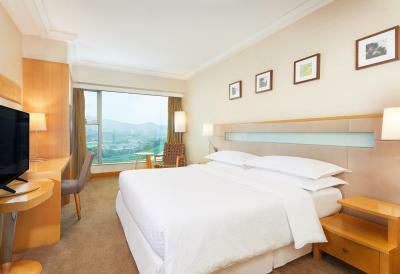 Any additional older children or adults are charged CNY 233.20 per night for extra beds. 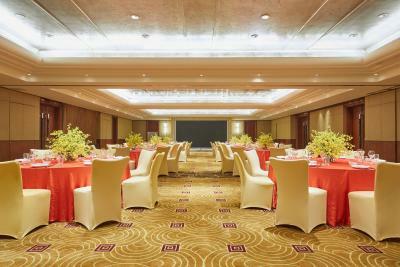 Greatwall Peony Dragon Pacific Four Points by Sheraton Shenzhen accepts these cards and reserves the right to temporarily hold an amount prior to arrival. Four Points by Sheraton Shenzhen accepts these cards and reserves the right to temporarily hold an amount prior to arrival. 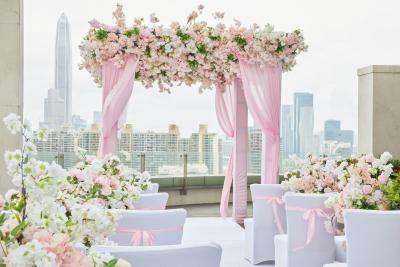 Kindly note that shuttle bus from the hotel to Futian Checkpoint and Futian Subway Station is provided by the property from 09:30 to 18:30. Clean, close to the border, staff were helpful. it is an old hotel, needs renovation. it is near to huang gang port. Room smelled a bit. Happening city center only by cab. No bathtub. Facilities felt ok for such a premium hotel. Location is good, it is a residential area. Plenty of restaurants and stores around hotel. Spent 15 minutes trying to order breakfast, had to wait long and got wrong order. When we booked this hotel, we did it because of the pool. Unfortunately pool was under maintenance when we arrived there, that was disappointing. But we talked to the hotel manager and as a good will gesture he offered us breakfast for the 3 days there, that was nice, and as I said before, breakfast was amazing. I will recommend this hotel to my friends, just confirm if everything is ok with the pool before going! I spent 3 nights there, I had the best sleep ever. Beds are super comfortable. The view from the room to HK was awesome! The breakfast was amazing, a lot of choices, between Western and Asian food. The staff is friendly. The location of the hotel is not the most central one, but there are a lot of bus stops close by, so it was not an issue. It's on a calm area, close to parks. 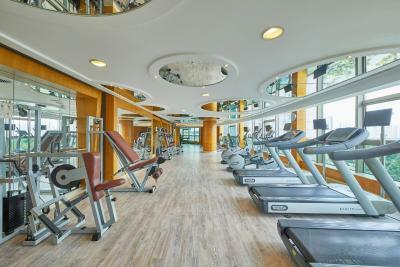 The gym was also a bonus, we use it every day in the morning and it was not crowded and with a lot of machines. It was a good stay, I will recommend this hotel to my friends. The bathtub wasn't draining properly, but housekeeping sent repairman immediately, so very satisfied for the speedy response . The greetings and smiley faces from all staffs from front desk , bell services, restaurant servers to maintenance, they are absolutely fantastic. Thank you! It's close to Futian Checkpoint but you gotta get there on foot for about 10-15 minutes if you have missed their shuttles. Just bit too far from the custom. very nice view. Quick checkin and out.